Thrive Approach allows us to recognise gaps in the emotional, relational development and learning of children. It provides a powerful way of working with children and young people that supports optimal social and emotional development. The Approach equips staff with the skills to work in a targeted way with children and young people who have struggled with difficult life events to help them re-engage with life and learning. Staff are able to create action plans with strategies to repair these missing links and encourage our young people to thrive. Each new term, I complete an assessment on each class group. This allows myself and the staff to analyse behaviours and pick a range of strategies for staff to use on a daily basis. We then pick activities which we complete together during Thrive lessons. 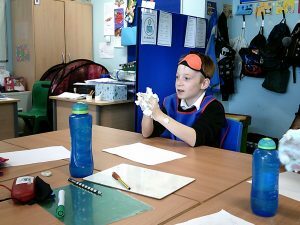 For example: a strategy for our Primary Nurture group last term was for staff to ‘use mirroring to help the child to learn about facial clues’. 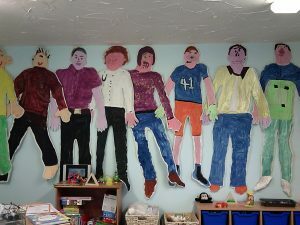 A chosen activity which supported this was to complete a ‘hand painting project by describing what you are doing as you paint, staying connected with the child through eye contact and smiles. Sometimes I assess pupils on an individual basis so the strategies and activities are designed to suit their personal development. Each term, I reassess the groups using the online system and we are seeing fantastic results and progress with some groups moving towards the next developmental strand. Thrive sessions have been packed with many different activities with the main focus for many students relating to recognising different emotions and feelings. 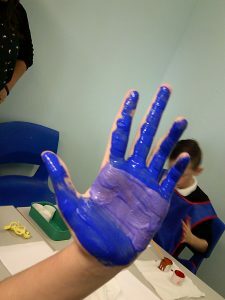 Some of the activities have included created hand prints using paints, soaps, creams, foams and other sensory products. 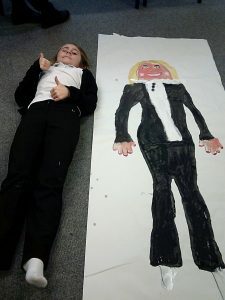 Some pupils drew a whole body image of themselves and painted them. They all look amazing and have pride of place decorating our newly built Thrive room. Some students are also working on building trust with staff and peers through the use of blindfold activities. During these sessions, they have taken part in blindfold food tasting, and played many trust games. Initially some of our students struggled to recognise and read others facial expression. After some activities and the help of mirrors, progress has been made in recognising and understanding different emotions. 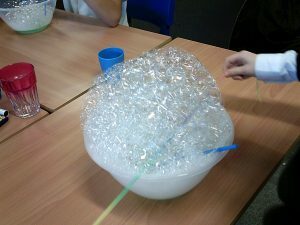 I have also seen huge progress with other pupils who found it difficult to ‘get messy’. These pupils now enjoy creating using messy play. Our pupils have really enjoyed their Thrive sessions and as I enter their classrooms for our sessions, many come straight to me to ask what we are going to be doing. The pupils are making great progress and I am very proud of them all.